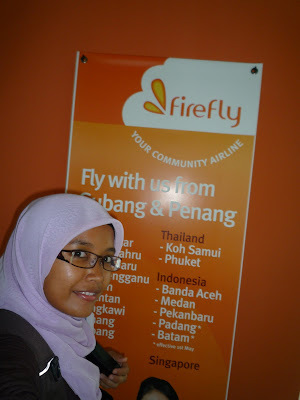 It wasn't my first time traveling with Firefly but it was my first time traveling with firefly from Alor Setar to Subang. As i reached Sultan Abdul Halim Airport 1 and half hour early, then i mingling around the airport. My flight was at 8.30 pm that day and i've been mentioned by the MAS staff that the check in counter will open at 7.00 pm. The place was sooo quiet that time. I went to buy a novel suggested by my friend at the convenience shop there. Luckily, i got it and it was the last unit. Then i my stomach can't wait until i reached KL to enjoy my meal with hubby. Then i decided to have a light evening food (which actually make me full). At the departure hall, there's one cafeteria and that cafeteria serve almost everything from the hawker menu till the western menu... plus you can have it panas-panas... To the sweet staff that speak pure Kedah dileq, i ordered toasted bread with red beans, scrambled egg and sausage... i got free hot drink for that. After check in, i waited inside. The flight arrived at 8.00pm and everybody board the plane at 8.15 pm. The weather was ok. The flight was full coz that weekend was a labour day. That was an hour trip that introduced me to a new friend from Pahang. It was her first time with firefly and she was sooo scared the plane to board. Of course, firefly using Focker airoplane... it's much smaller compared to the normal plane, plus i think maybe she saw the fan and that make her unconfident with the flight... i knew she was scared coz she told me and then i chit chat with her until she didn't realize that we've already up to the sky above....hehehee...I'm happy for that. During the almost 1 hour flight, we've been serve with orange juice and a small pack of biscuits. Credits for that. As we arrived at Subang International Airport i was mesmerized with the new Subang Airport. It wasn't as i expected.... way tooo beautiful and looks luxury. Hubby waited for me there and we straight away went back home to have our late dinner. Thanks to my MIL for preparing a yummilicious mee kuah. And that's the end of my first Firefly trip to Subang International Airport.